From the day we began construction on our new Community Memorial Hospital (CMH) in Ventura, we knew we were building something that would have a long and significant impact on our community. We knew the most advanced technology, all private rooms, and enhanced emergency and critical care areas would allow us to better meet the growing healthcare needs of residents across Ventura County, and we knew the new facility would help us attract the next generation of talented physicians. But until recently, our new hospital was just a building – a beautiful collection of bricks and mortar waiting to be brought to life. Over the last several weeks as we’ve begun the move into our new CMH, its final and most crucial feature has taken shape. That vital element of this extensive and exciting process is the human element – the physicians, staff, and volunteers that give our new Community Memorial Hospital the heart and soul that our community knows, trusts, and loves. It’s only fitting then that one of the first of over 500 pieces of local and regional artwork to be installed in our new CMH perfectly encapsulates and communicates the importance of people in the work that we do. 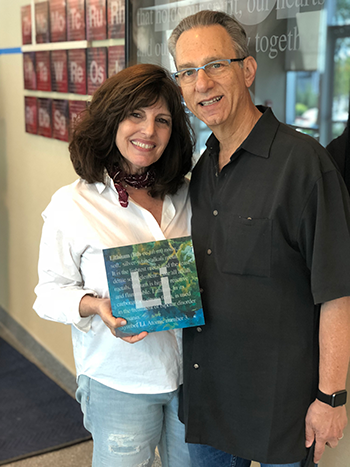 Comprised of two installments placed in our new CMH Ocean Tower Cafe, “ELEMENTAL HUMANISM” by Lori Shocket, M.D., serves as a reminder that the human element is the force that holds our hearts and our commonality together. 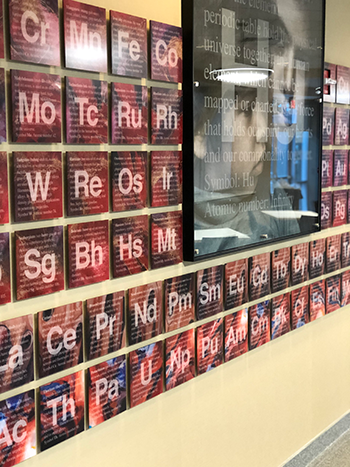 Created by Russian scientist Dimitri Mendeleev, the periodic table of the elements is a visual depiction of the relationship between each physical elements, as well as a means of predicting their individual behaviors, reactions, and interactions. It was this organizational chart that inspired The Human Element Project and served as the basis for Dr. Shocket’s Elemental Humanism installation(s). Artist Lori Shocket, M.D. pictured in front of “Remembering the Human Element 2018” with husband Neil. Each element of the ELEMENTAL HUMANISM periodic table is an acrylic and pastel enhanced electron micrograph of a variety of human tissue. The remainder of the table is organized into ten different sections, with each section representing a group of elements – each element on its own tile – with like characteristics. The background on the tiles for each group is an acrylic and pastel enhanced electron micrograph or an acrylic painting of an assortment of human tissue. These tissues include myocardium (heart), goblet cells (mucus membrane), neurons (brain), sertoli cells (male reproductive), fallopian tube (female reproductive), pleura (lung), columnar epithelium (gastrointestinal), osteocytes (bone), retina (eye), and malignant cells (cancer). 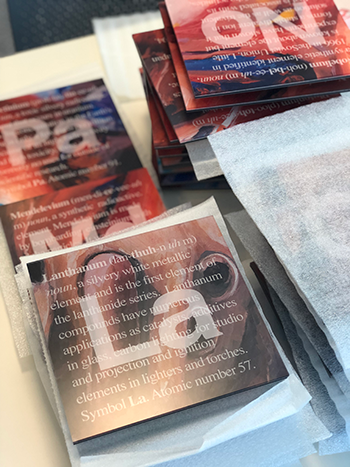 The second of the two installations, ELEMENTAL HUMANISM: Celebrating Diversity 2018, is comprised of ten 24 x 24 acrylic and chalk enhanced photographic prints featuring faces from around the world and the Human Element (Hu) described against the photographs in their associated languages. We invite you to learn more about The Human Element Project and Dr. Lori Shocket’s other installations by visiting www.TheHumanElementProject.com. The installation of “The Kelp Forest” by Frank Bauer in the new CMH Emergency Department entrance. 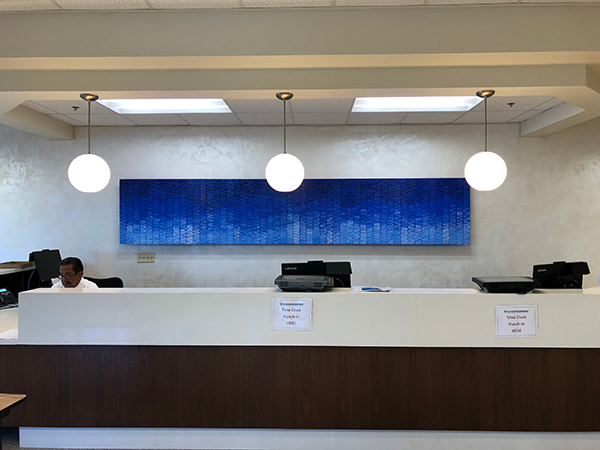 As we prepare to open our new Community Memorial Hospital Ocean Tower to patients and the public this winter, we are working to install over 500 pieces of original artwork with pieces from Ventura, Los Angeles, and Santa Barbara County artists. Each floor of the hospital has a theme, and many placements match the use of the rooms. Playful pieces adorn the walls of the pediatrics unit and calming art comforts friends and family members in surgical and critical care waiting rooms. 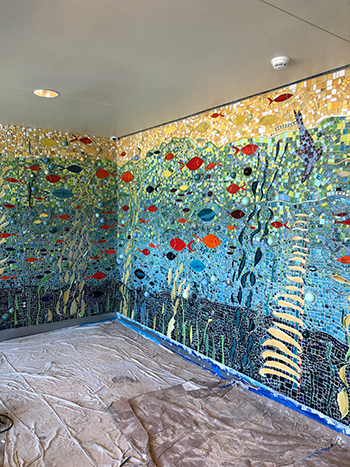 Other notable works currently installed on the first floor of the new hospital include Hiroko Yoshimoto’s “Peaceful Ocean” in the main lobby and Frank Bauer’s “The Kelp Forest” in the Emergency Department entrance. Each piece of artwork in our new CMH Ocean Tower was curated by our Community Memorial Hospital Art Advisory Board (AAB). The volunteer board, led by co-chairs Richard Amend, Susan Petty and Barbara Hirsch, has devoted countless hours to helping bring our new hospital to life with incredible local and regional works. Board members include Adam Thunell, CMHS Vice President of Operations and AAB Administrative Advisor, Dr. Moustafa Abousamra, Architectural Oversight Committee Advisor, Dawne Folkes Crushing, Colin Fraser Gray, Lydia Hopps, Mary Perez, Susan Scott, Denise Sindelar, Martha Spriggs, Hiroko Yoshimoto, and AAB Secretary Leila Benoun. Please join us in thanking them for their dedication to this incredible project! Hiroko Yoshimoto’s “Reflections” greets guests to our new CMH in the main lobby.